Less is definitely more when it comes to summer beauty, and especially if you're going to be heading out to the pool or beach. There's absolutely no need for a full face of makeup when you're going to be out having fun under the sun. I've teamed up with Walgreens and #CollectiveBias to bring you this summer beauty edition of #WalgreensBeauty. The key to a summer beauty look is simplicity and I'll only be using the following coral colored beauty products for today's natural beauty look. STEP ONE: Apply one or two coats of waterproof mascara, today I'm using the newest Maybelline mascara. The Pumped Up! Colossal Volum' Express Waterproof Mascara has a big teardrop shaped brush and claims to volumize your lashes by 16 times. 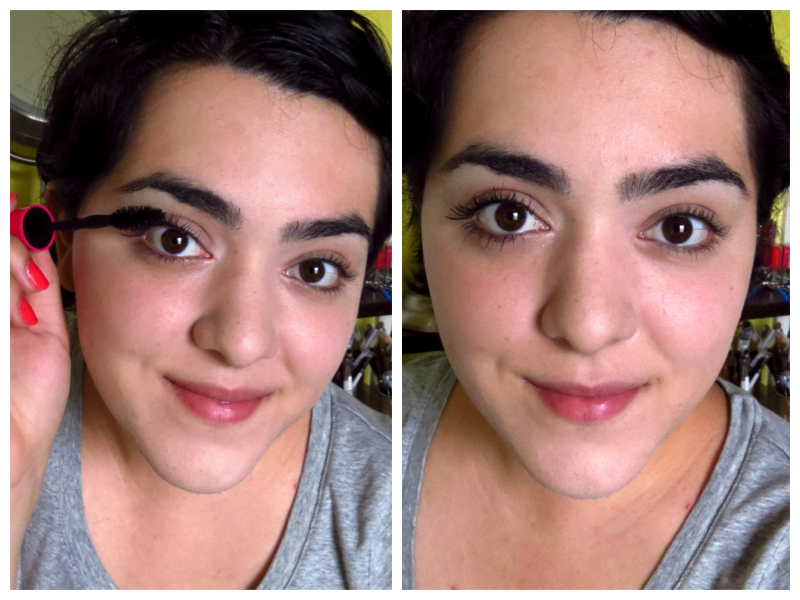 I find that the mascara makes my lashes look much bigger, longer, and if you wiggle the wand at the root then you can create the illusion of a thicker lash line. I know some people are hesitant about waterproof mascaras but this one comes off easily with an oil based makeup remover, so you won't have to rub your eyelids to remove it. 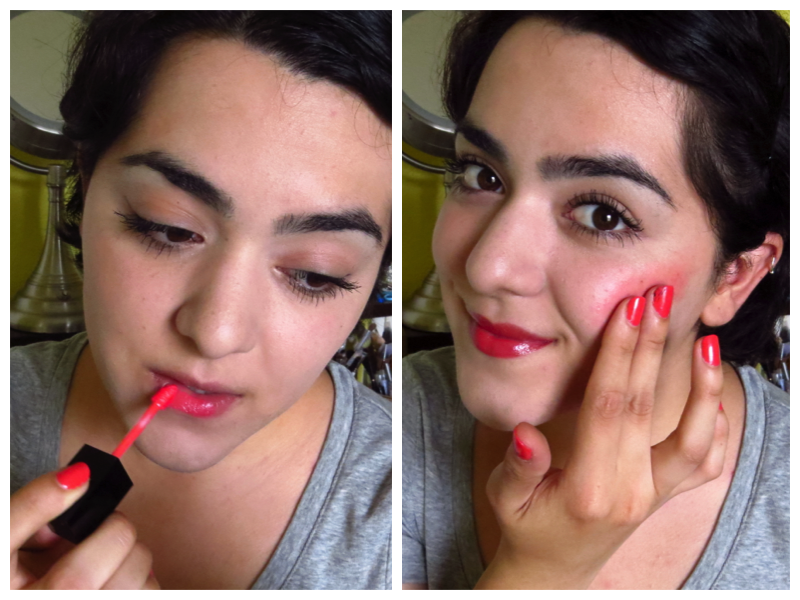 STEP TWO: It's time for my favorite part of my beauty routine- applying the lip product! I am not a fan of gloss, but boy do I love these new glossy/balm hybrids. Today I'm using the Revlon ColorStay Moisture Stain in Cannes Crush. I'm sure you're not surprised that I decided to go for a shade with a French city in its name but apart from the name the color is perfect for summer. I am in love with this juicy coral color and also the feel of this lip product. This lip product has a bright color, feels like a balm, and once that moisturizing balm texture is gone you're still left with color on your lips. I've worn this several times to work because I love that I don't have to reapply it often during my 8-hour shift. I also used the ColorStay Moisture Stain on my cheeks as blush and it worked amazing! It gave my cheeks a very natural flushed look. STEP THREE: Matching nails! I decided to go for a shade that was the same shade of coral as my lip color. I used the Essie Nail Lacquer in Sunday Funday on my nails and I've been loving it. If you've been following me for a while then you know that I'm not the biggest fan of Essie nail polish but something must have happened because this formula is amazing! I painted my nails on Saturday and it's been three days later and I have absolutely no chipping. It is crazy how well this nail polish has lasted on my nails! FINAL LOOK: A very soft and natural look which is perfect for the pool or beach. I decided to only apply a little concealer on blemishes, but the rest of my skin is bare. That's why you can still see darkness under my eyes and around my forehead, and also a few freckles on my nose. There's nothing worse than going to the beach with a full face of makeup so that's why I kept it very simple today. 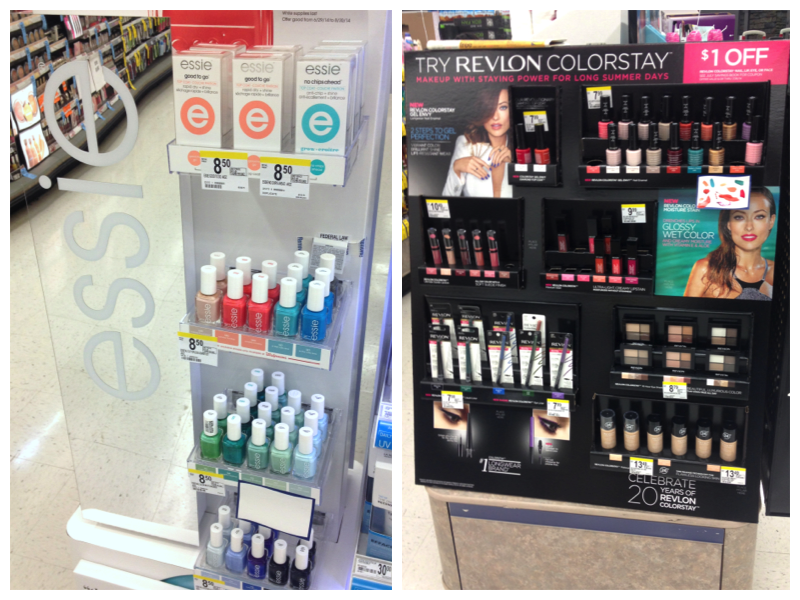 Finding the products that I used at your local Walgreens is extremely easy because of their displays. One of the reasons why I love shopping at Walgreens is because their displays are eye catching and well organized. If you're on the market for new products from your favorite brands, then look for the displays around the beauty section and check-out area. Speaking about the beauty check-out area, you can receive a six-piece travel brush set from Studio 35 Beauty when you spend $20 on a beauty purchase. 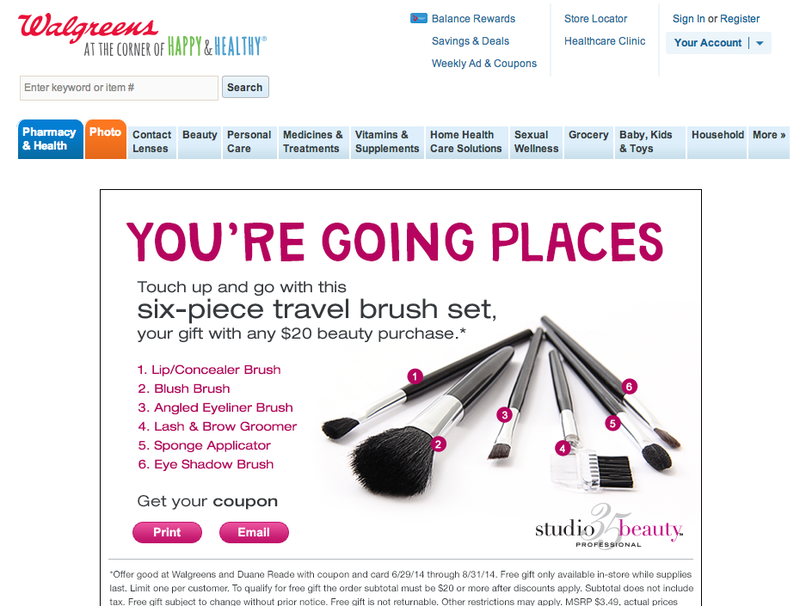 All you have to do is spend $20 on any makeup, sunscreen, or skincare item to qualify for the makeup brush set. You have to print or have the coupon emailed to you so you can present this to the cash register and you'll receive your brush set. It's as simple as that! Insider tip: Always pay for your beauty products at the cash register in the beauty section because they always have extra coupons. The cashier who helped me at Walgreens gave me a total of 4 coupons without even having to ask her. I really hope you enjoyed this blog post! I would like to thank Walgreens and #CollectiveBias for allowing me to share this natural look with you today. What is your favorite color for summer? Let me know in the comments below. I'm currently feeling the warm pinks lately, that's why I quickly gravitated towards the coral products used in this #WalgreensBeauty blog post. Disclaimer: This is a sponsored blog post in collaboration with Walgreens and Collective Bias. I believe that this blog post was a perfect fit for my blog so that's why I took this opportunity. All opinions and stories are completely my own.